Fountains and waterfalls transform the landscape with movement and sound. Water in the landscape can make a chaotic landscape calm and make a static garden active. As a result, fountains and water falls play many roles in the garden. A waterfall cascading into a koi pond will attract wildlife such as birds, turtles, and frogs to your landscape. A graceful, marble fountain welcomes your visitors as they enter your property. A discretely-placed ceramic fountain relaxes an intimate, outdoor sitting area. Dry river beds add a rustic feeling to native and southwest-style landscapes. Fountains, waterfalls, and riverbeds create soothing environments screening out unwanted noise and distractions. 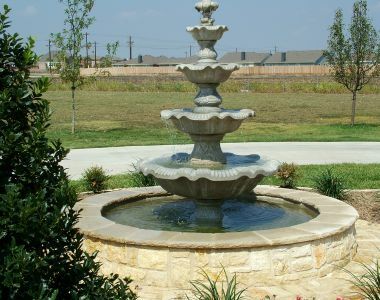 Fountains come in all colors, shapes, sizes, and materials including cast stone, resin, marble, bronze, fiberglass, and ceramic - pricing varies accordingly. 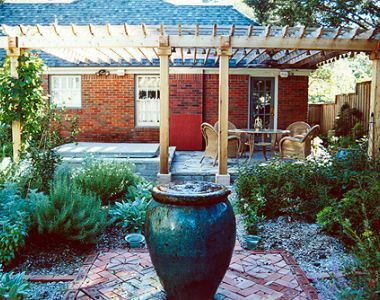 For example, a small bronze courtyard fountain with installation may cost around $1,200, whereas a larger, multi-tiered fountain would price around $9,000 installed. Waterfalls and river beds are often incorporated into larger water features such as swimming pools, ponds, and water gardens. Common materials for waterfalls and river beds include flagstone, local stone, rocks, and boulders. A current trend in water features is the Pondless' waterfall; pondless' waterfalls are a cost-effective, low-maintenance option for those desiring a water feature but not the extra expense or additional upkeep associated with traditional waterfalls. Pondless waterfalls, because of their limited size, are great for small or courtyard landscapes. Pricing for waterfalls and river beds will vary depending on the size, materials, and complexity of the installation. Browse YardHookup.com to see styles, options, and pricing for waterfalls, fountains, and riverbeds. All water features require at least some monthly maintenance. Review information in books, magazines, and YardHookup.com to determine what kind of water feature is best suited to your lifestyle. Save some time prior to meeting with a contractor by drafting a rough sketch of your landscape indicating several possible locations for your new waterfall, pond, or riverbed. When interviewing potential contractors and installers, request and verify all references and licenses. Request to view project portfolios for any contractors under consideration. Once your project is completed, ensure you understand any required maintenance.